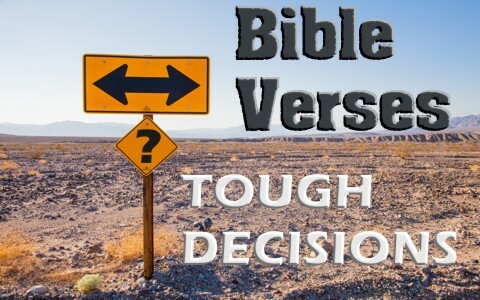 Here are seven great Bible verses to lean on when making tough decisions. I had a lady ask a question from many of her friends on Facebook and to the very last one, they gave her advice that was not biblical. It was their own opinion that she should do something but it was not based upon what the Scriptures teach. She needs to trust in the Lord and trust what His Word says in the Bible. We can’t take our advice from anyone if it’s contrary to the Bible. We can’t lean on our own understanding but neither can we lean on anyone else’s understanding either because they are leaning on something that’s not solid. When we delight in the Lord, as Psalm 37 speaks much about, we can know that God will establish a man or woman’s steps in life. The key is if we are delighting in God and to delight in God means we are overjoyed to be able to serve God and that is accompanied with a desire to obey God. God delights in us when we live lives that are pleasing to Him and when we please God we are delighting in Him and He’s delighted to grant us the desires of our hearts. Ever been too proud, like I have been, to seek counsel for a decision that is a difficult one? The fact is, “Where there is no guidance, a people falls, but in an abundance of counselors there is safety” (Prov 11:14) so there is safety in counseling and there is safety in the number of counselors, therefore there might be a better chance for success in making the right decision if godly counsel is sought and of course praying to God for His guidance too. There is not much safety in the counsel of one person, especially if they’re not born again. We have God with us and so since God is with us and God is for us, who or what could ever stand against us? Nothing is the short answer because if God’s for you, there’s no worry about whom or what could ever be against you. This includes your enemies who hate you for your faith in Christ; an illness that cannot keep you from the Lord since even death can’t separate us from Him (Rom 8:38); and can financial troubles. Nothing outside of heaven can keep you from going there. Jesus once said that we are to count the cost of following Him. He gave an example in Luke 14:28 where He said “For which of you, desiring to build a tower, does not first sit down and count the cost, whether he has enough to complete it?” Jesus’ conclusion was that “In the same way, those of you who do not give up everything you have cannot be my disciples” (Luke 14:33) since “Salt is good, but if it loses its saltiness, how can it be made salty again? It is fit neither for the soil nor for the manure pile; it is thrown out” (Luke 14:34-35). This chapter (Acts 14) is so very encouraging because the Apostle Paul and Barnabas had been encouraging them to continue in the faith, despite severe persecution. He told them what James told them (James 1:2-3) that is would be through many, not a few, tribulations that we have to enter into the kingdom of God. To promise someone that life will be better or easier once someone comes to saving faith in Christ is not true; in fact it is just when it gets harder. God never promises an easy road because the gate is narrow and the way is difficult. Jesus said we are to “Enter by the narrow gate. For the gate is wide and the way is easy that leads to destruction, and those who enter by it are many” (Matt 7:13) because “the gate is narrow and the way is hard that leads to life, and those who find it are few” (Matt 7:14). When we are faced with tough decisions in life, we have read that we should seek a multitude of godly counsel and trust or lean on God’s Word, not our own understanding, and even with a bad decision, nothing can separate us from God and that includes things to come, people in power, and no height or depth. Not even death! Nothing in all creation can detract from God’s purposes in our lives, even with wrong decisions, because God can take the bad and turn it into good (Gen 50:20). No matter what choices we make, good or bad, God says that they will all work out according to God’s purpose and make them to be for our good (Rom 8:28), so trust God, seek counsel, lean on God and His Word, and then leave the results up to God. He doesn’t force us to make decisions but He will help us when we are faced with a decision that is hard to make. What seems right to man is not always right in God’s eyes. Solomon leaves us with great words of wisdom about making tough decisions in life; “There is a way that seems right to a man, but its end is the way to death” (Prov 14:12) since “The way of a fool is right in his own eyes, but a wise man listens to advice” (Prov 12:15). Next post: What Is A Biblical Worldview?